The Agricultural Development Bank (ADB) has advanced steps in opening new service locations in the six new regions in Ghana. The new locations will include Dambai, Damongo and Nalerigu with a major facelift to existing locations at Goaso, Techiman and Sefwi-Wiawso to provide excellent banking services such as financial advisory services, agric financing, access to credit, corporate and retail banking as well as cutting edge electronic banking services. Three new banking locations have been opened this week at Bukom, Juaboso and Kpassa in the Greater Accra, Western and Oti Regions respectively by the Managing Director, Dr. John Kofi Mensah. Dr. Kofi Mensah stated that the opening of the new locations were part of the medium to long term strategy of the Bank to bring ADB closer to the people through physical and virtual locations via Agency Banking. “This forms part of the Bank’s medium to long term strategy of bringing banking closer to the Ghanaian populace, enhancing agriculture and also encouraging the culture of savings especially amongst the people in these areas,” he said. “Management realized that as a result of urbanization and population growth some of our branches have become distanced from some customers hence the need to open more locations”. He emphasized the need for customers of the Bank to link their accounts to their mobile wallets at any ADB branch to enable them conveniently save and access their monies wherever and whenever. He further stressed the need for customers and non-customers of the bank to embrace the new ADB Visa Prepaid cards which allows everyone to load funds instantly and securely for all shopping around the globe. The Area Manager of Eastern-Volta of ADB, Mr. Robert Karikari Darko during a courtesy call on the Chief of Kpassa, Ubor Konji Tssun VI, said ADB recognized Kpassa as a strategic area with the ability to contribute positively to the socio-economic growth of the country. 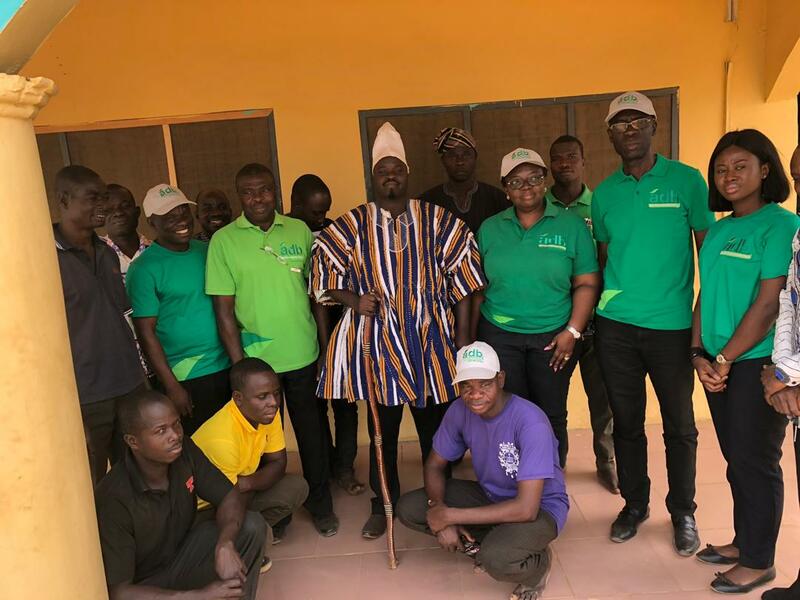 “The Kpassa Market day brings people from neighbouring towns and even Togo to transact business, it is therefore necessary for our market women and men to have a secured place to save their money after a hard day’s work, he said. In his response, Ubor Konji Tssun VI, expressed his profound gratitude to the Board and Management for opening the location in his town and pledged the support of the traditional authorities and indigenes to ensure ADB remains in business in the town.